Street Gangs Research Papers look at the different factors that influence the participation in gangs. Street gangs and the accompanying incidence of gang violence is not a phenomenon that is confined to the nation’s inner cities, minority classes or the male gender. According to the research conducted by an author, although gang organizations exist predominantly in large cities, the incidence of gang behavior can also be found in suburban areas with much smaller populations. Similarly, gang behavior crosses ethnic barriers and has been demonstrated by members of African-American, Asiatic, European and Hispanic origin. In the context of gender, most gangs are made up of young males however some gangs allow young females to have limited participation and an even smaller number are entirely female dominated. Participation in street gangs presents a significant risk of violent death, not only for members but also for innocent bystanders. According to an author, gang members are 60% more likely to die in violent homicides, 80 to 95% of which will be gun-related deaths. The random nature of gang violence presents a similar risk of death or injury to individuals that have no association with gang related activity. An author proposes that the mass media of television and music play a significant role in sensationalizing gang behavior and in contributing to the scope of participation across society. In addition, social and economic inadequacies such as poverty, segregation and poor education often work to foster gang activity. An author likewise offer a number of factors that contribute to the formation of and participation in gangs and their violent activities. According to the researchers, gangs can be categorized as social, delinquent or violent. Unlike the first two, violent gangs demonstrate the clear objective of gaining power and satisfaction through violence. The objective of creating an organizational structure for carrying out violent activities can be attributed to the lack of family or community structures and the misplaced rationale that violence allows gang members to control their environment. An author support these assumptions with a comparison of the structure and characteristics of the dysfunctional family. An author suggests that the growth of gang violence offers major implications for the development of public policy and strategies that address the root causes of such behavior. Even further but perhaps far less achievable is an authors suggestion that gang members be encouraged to participate in family and group oriented therapy, the purpose of which would be to assist members in developing loyalty and survival skills outside of gang membership as well as in determining the fundamental motives for their gang involvement. Combating Gang Violence - Combating Gang Violence Research Papers look at a sample of an order that was placed, with specific information placed on the Federal and States Laws in place to help assist with stopping gangs. Always Running - Research papers on Always Running by Luis Rodriguez examine the autobiography of Luis Rodriguez. 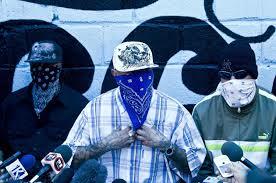 Youth Gangs - Youth Gangs research papers look at how gangs such as the Crips and Bloods were formed. Russian Mafia - Russian Mafia Research Papers look at organized crime groups and their elements. Hell's Angels - Interestingly enough, Hell's Angels didn't begin as a motorcycle gang. They got their start in airplanes in 1941 prior to America's involvement in the war. Violence in Scandinavia - Violence in Scandinavia Research Papers delve into an example of an order placed on an type of violence that took place in Scandinavia. Monster: The Autobiography of an LA Gang Member - Monster Research Papers look at a novel written by Sanyika Shakur about and L.A. gang member. Paper Masters writes custom research papers on Street Gangs and look at the different factors that influence the participation in gangs.